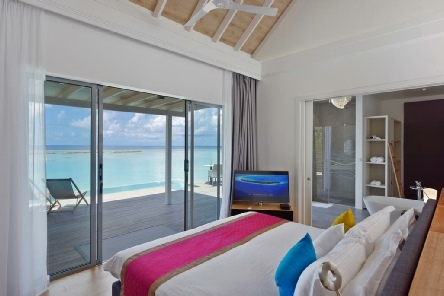 This large island seamlessly combines laid-back Maldivian life with an extensive choice of facilities. One of the Maldives’ most popular resorts, Kuramathi is perfect if you're looking for variety alongside relaxation. The excellent choice of restaurants and bars means upgrading to Select All Inclusive is a must! North Ari Atoll, 90 minutes by speedboat or 20 minutes by seaplane from Male. Rooms on the island range from simply designed Garden Villas and Beach Villas nestled in abundant vegetation (but just a short walk from the beach) to Deluxe Beach Villas with Jacuzzi that face the lagoon and luxury Pool Villas that sit right at the edge of the beach. Two Bedroom Beach Houses sleep six; ideal for families or friends travelling together. For the iconic overwater experience, opt for a Deluxe Water Villa perched above the turquoise lagoon. There are two oceanfront infinity pools plus a lagoon-style pool shaded by palm trees, and snorkelling on the house reef is possible straight from the beach. Other facilities include a watersports centre and a kid’s club. 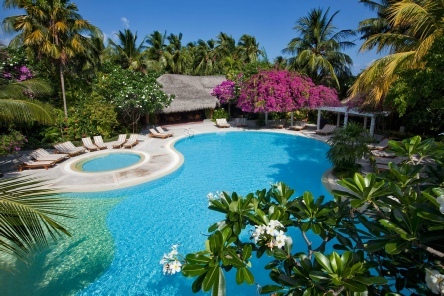 The Spa at Kuramathi is set amidst lush vegetation. Offering a selection of treatments based on traditional rituals from Europe, India, Thailand and Indonesia, it uses only the best YonKa and Voya products and natural oils and ingredients. Great facilities, a relaxed feel and one of the best All Inclusive concepts around - it’s hard to beat Kuramathi! 2019 package holidays to the Kuramathi Island Resort Maldives Prices are per person based on two sharing.